Each thick, pre-moistened wipe kills 99.9% of viruses and bacteria on hard nonporous surfaces when used as directed. Packaged in several convenient sizes, this product is ideal for cleaning, disinfecting and deodorizing. Use on kitchen counters, appliances, stove tops, cabinets, floors, garbage cans, toilet exteriors, bathtubs and sinks. INNER PACKAGING: 6 Tubs. 80 Wipes per Tub. 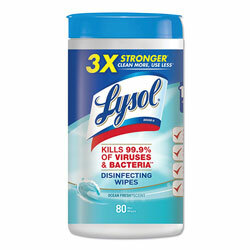 Disinfecting Wipes, Cleaners and Sanitizers from Lysol! 5443 In Stock today.